Whether you’re doing the entertaining or the partaking this holiday season, you may need a little inspiration. 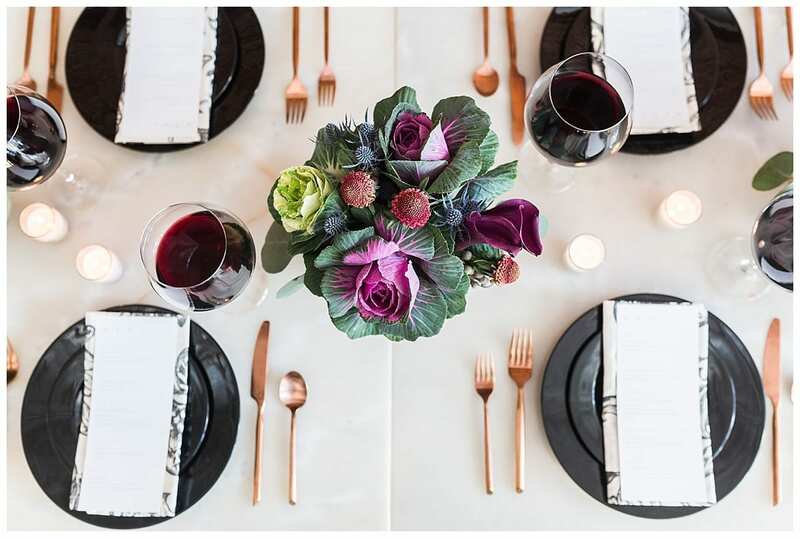 So we asked three of the city’s top event planners to design tablescapes and give their best tips for being both the host and the guest. Then all that’s left to do is clink a glass and toast to the season. Plan on a seat for everyone: If it’s chilly out, most guests will stay indoors. So plan to have a seat for everyone, whether it’s a chair at a table, a spot on the sofa, or bar stools at the kitchen counter. Start your prep work early: Three or four days before, deep clean the house and buy the groceries. One or two days before, start your prep and pre-cooking—dice up garnishes and veggies, put sauces in bowls, pre-mix a signature cocktail in batches, and make side dishes and appetizers that can easily warm in the oven. Stage everything the night before. Greet your guests: It’s hard to do, but important; it sets the tone, and guests can tell when the host is stressed. Do your prep work so you have more time to spend with guests. Delight with the details: My five must-haves? Fresh, seasonal flowers (farmer’s market), a scented candle (vanilla, evergreen, or pumpkin spice), festive cocktail napkins (hide the paper-towel roll), decorative hand towels in the powder room, and music (low but audible). Create the ambiance. Make an effort to mingle: Take some of the pressure off the host by starting conversations yourself. Find out how others know the host—there’s usually a story there, which will keep the conversation flowing. And if you don’t know anyone, admit it! Find another shy, solo guest, and let that be your conversation starter. Always RSVP, even for a casual event: The host wants to feed you and give you cocktails. What more can you ask for? Help the host plan for how much food and drink to get. Follow the dress code: Whether you’re supposed to don an ugly-Christmas-sweater party or sparkly cocktail attire, oblige the host. He or she has put a lot of thought into the party theme, décor and menu. Don’t try to be a superhero: There’s no need to do everything yourself. Hire some fab bartenders and an amazing caterer. You want to be able to enjoy your own party. Remember the ice: Often people forget, but extra ice is critical for entertaining. The typical freezer or icemaker can’t produce enough for all of the drinks at a party. Incorporate a surprise element: Do something to wow guests. In the past, we’ve had an aerialist pouring champagne upside down as guests entered, fire dancers performing as guests leave, synchronized swimmers entertaining in the pool, or servers body-painted in the party theme. It brings excitement to a traditional gathering. 4. Remember the restroom: If there’s one thing everyone will do that night, it’s use your restroom! Make sure it’s clean, but take it further: have fun quotes on the hand towels, keep a candle burning, and set out fresh flowers and soap. 5. Have fun with favors: They were one of the best parts about birthday parties as a kid, so why not embrace them as adults? Have something for your guests when they leave or, if you hire a valet (which I highly recommend), ask the guys to put the favors in the cars. It’s a nice surprise for guests as they drive off. Respect the seating: If it’s a sit-down dinner, don’t go around switching up your name card. They were each put in a particular place for a reason. Definite no-no’s: Snooping through the hostess’ medicine cabinet or asking for a to-go plate. Don’t show up empty handed or leave over served: But if you do the latter, call an Uber! Make sure your tablescape represents you and your home: Don’t be afraid to depart from the typical holiday décor, and don’t feel obligated to buy all new things for every dinner party. Bring in elements you already own, such as pillows, dishware, candles, and décor. Pay homage to your locale: You’ll often have out-of-town guests during the holidays, so tuck in subtle details that pay homage to your city. On this table, I snuck in a crown to represent the Queen City. These pieces can be great conversation-starters as well. Create a menu and place cards: This will help alleviate any social anxiety guests may have about where to sit or what they are eating, and that creates a more welcoming and easy atmosphere. Make sure there’s enough to drink: Offer your guests a beverage as soon as they arrive, and be sure there is enough to last well through the night. Warm ciders, red wine, and local craft beers are always a holiday hit. Embrace texture: I love combining different textural elements, metallics, and tying in nature, when possible. Don’t be afraid to mix silvers and golds—it’s not against the rules—and warm up your table with wooden chargers that translate easily to both fall and winter décor. Never come empty-handed: Always bring a hostess gift—it doesn’t have to be expensive. A bottle of wine or a holiday-scented candle is always appreciated! Don’t be late: Your host has most likely timed the meal to come out at a certain point, and you don’t want to miss it. Write a thank-you note: After thanking your host at the end of the night, send something tangible as well. It shows your appreciation for their efforts, and, hey, it may even get you invited back for the next dinner party.